Each gene on a chromosome can be thought of as the instructions for making a particular protein in a cell. However, the genes themselves cannot direct the synthesis of the proteins they encode but must first be converted into a form that can be recognized by the cellular protein-making machine, the ribosome . This conversion process is called transcription. During transcription the instructions held in the genes (in the form of deoxyribonucleic acid [DNA]) are transcribed into a chemical form called ribonucleic acid (RNA). Because this RNA carries the message, or instructions, from the genes to the ribosomes, where it is ultimately converted into a protein molecule, it is called messenger RNA (mRNA). Most genes in a cell code for protein and hence are transcribed into mRNA. However, a few genes code for different types of RNA that are not used as templates for protein synthesis but instead are ends in themselves and carry out a variety of functions in the cell. Examples of these other kinds of RNA are transfer RNA (tRNA) and ribosomal RNA (rRNA), which are both critical to the process of protein synthesis. Much of the pioneering work on transcription was carried out in prokaryotes , most notably in the bacterium E. coli. These studies laid the foundation for work that was later carried out in the more complex eukaryotes. The enzyme that carries out transcription is called RNA polymerase, and it consists of four kinds of polypeptides , designated α,β,β′ and σ, which are bound together into a complex called a holoenzyme. 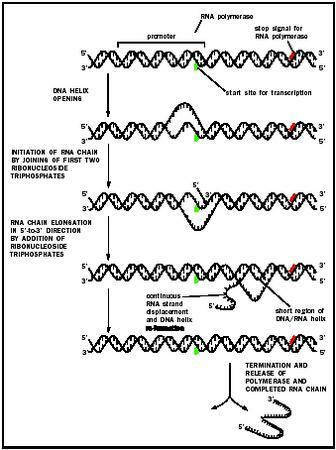 Transcription can be divided into three phases: initiation, elongation, and termination. Initiation occurs when the polymerase, sliding along the chromosome, encounters a promoter , a sequence of DNA that identifies the beginning of a gene. The promoter contains two sequence elements, six base pairs apiece, called the -10 and -35 elements, which are located ten and thirty-five base pairs respectively upstream of the transcription start site. DNA is double-stranded, but only one side serves as a template from which RNA is made. With the two strands bound to one another, the template strand must be made accessible if it is to serve as a template for RNA synthesis. To begin, the polymerase unwinds a region of approximately seventeen base pairs, setting the stage for the formation of the first phosphodiester bond. Unlike DNA, the synthesis of RNA can be initiated without the need for a primer . RNA is made by linking together ribonucleotides in an order dictated by the DNA template strand. The essence of transcription is to use the sequence of nucleotides already on the DNA strand to dictate the sequence of RNA nucleotides that will be formed into the new RNA strand. The four DNA nucleotides are adenine, guanine, cytosine, and thymine (A, G, C, and T). RNA nucleotides are A, G, C, and uracil (U). RNA polymerase pairs up an RNA nucleotide with each DNA nucleotide. However, rather than matching the DNA sequence, the polymerase pairs up complementary base pairs. G is always paired with C, so that if the DNA sequence is GGCC, the resulting RNA sequence is CCGG. The A of DNA is paired with the U of RNA, and the T of DNA is paired with the A of RNA, so that if the DNA sequence is AATT, the RNA sequence is UUAA. Thus, like DNA replication, the rules of Watson-Crick base pairing apply during transcription. The nucleotides used in RNA synthesis are triphosphates, meaning they have three phosphate groups attached. This energizes them, and hydrolysis of these phosphates powers the transcription process. Once the chain has reached a length of approximately ten ribonucleotides the subunit dissociates , leaving the core enzyme (α 2 ββ′ ) to continue transcribing until the signal for termination is reached. Termination signals on DNA vary but the most common is a GC-rich region followed by an AT-rich region. Unlike the bacterial RNA polymerase, eukaryotic RNA polymerases cannot initiate transcription by themselves but need the help of a set of proteins called the basic transcription factors. The basic transcription factors perform a number of functions, including binding to gene promoter regions and attracting the appropriate RNA polymerase to the initiation site, as well as unwinding the DNA double helix to allow access of the incoming ribonucleotides of the growing RNA chain. RNA Polymerase II Transcription. The promoters of eukaryotic genes have been intensely studied, especially those transcribed by RNA polymerase II. Most genes transcribed by RNA polymerase II contain a sequence called a TATA-box located twenty-five to thirty-five nucleotides upstream of the transcription start site. The TATA-box contains the sequence TATAA, which is recognized by a multicomponent transcription factor called TFIID. One of the components of the transcription factor is the TATA-binding protein (TBP), which directly links to the TATAA sequence. RNA polymerase II genes contain additional binding sites in their promoters for transcriptional regulators and can even be affected by elements located at large distances called enhancers. In contrast to prokaryotes, transcription termination by RNA polymerase II does not occur simply by release of the RNA molecule. Rather, transcription continues well beyond the termination point, and the transcript is later cleaved to the appropriate length. Following cleavage an enzyme called poly-A polymerase adds approximately 250 adenine residues to the tail end of the transcript. Synthesis of an RNA molecule by RNA polymerase. transcription start site. Interestingly, although most of the basic transcription factors are not shared between the three polymerases, TBP, which was first discovered as a protein involved in RNA polymerase II transcription, has now been found to be required for transcription by all three polymerases. Thus, despite the differences between the polymerases, they have all incorporated TBP into their mechanism of transcription initiation. Spanish molecular biologist who received, with Arthur Kornberg, the 1959 Nobel Prize in physiology for discovering an enzyme that can be used to make ribonucleic acid (RNA). His work was fundamental to modern biotechnology. Each polymerase has its own set of basic transcription factors, designated by a number and a letter. For example, TFIIA is transcription factor A, which functions with RNA polymerase II. (1)i just want to tell you people to add the names of the nucleotides of RNA. (2)I want you to inclde the defination of codon and what codon does?. (3)the amino acid that tRNA is carrying?. (4)draw and label ribosome and and tRNA.